A successful enterprise BI environment seamlessly encompasses a wide variety of applications across an organization’s departments and workgroups. A key feature of enterprise BI environments is that they are based on a common set of building blocks (i.e., metadata) with which users can develop reports, dashboards, and other BI components. This promotes internal self consistency and a single version of the truth across the enterprise at the lowest cost of ownership. In addition, the high performance and scalability of enterprise BI supports the needs of the entire organization, regardless of how or where business users access their BI. Enterprise BI also enables business users to address their immediate requirements by leveraging all five styles of BI, including dashboards and scorecards, enterprise reporting, OLAP analysis, advanced and predictive analysis, and alerts and notifications. With these capabilities, business users can build a wide variety of applications for both departmental and interdepartmental use. It can take several years to successfully establish a fully integrated, cohesive enterprise BI environment. To achieve enterprise BI, organizations must first develop and evolve an enterprise BI “blueprint” or strategy. Such an overarching strategy takes time to implement and will be revised over time, but is essential to the direction of an organization’s enterprise BI development. The cornerstone of any enterprise BI blueprint should be the incremental gathering of data and development of BI metadata and applications across the organization. As the amount of collected data increases, that data should be increasingly leveraged through BI applications. This leads to more business users having the opportunity to benefit from BI insight. Perhaps most importantly, however, is that the incremental costs of enterprise BI become justified as the number of users grows and the return on investment becomes clearer. More specifically, the key to incrementally building an enterprise BI environment is to foster the growth of departmental BI applications across the organization. Departmental BI is inevitable. Its smaller scale, flexibility, and convenience enable individual departments and workgroups to satisfy their immediate business imperatives in a timely fashion. As a result, more and more departmental “islands” of BI surface throughout the enterprise over time. It is important to promote the use of these systems across the entire organization. This creates, in effect, an information culture with an understanding of the value of BI investment. Fostering departmental BI is essential to increase user adoption and lay the necessary groundwork for an integrated enterprise BI environment that encompasses all of these departmental islands. To eventually reach the goal of enterprise BI, organizations should work to incrementally consolidate their departmental islands of BI into the enterprise environment. This process must be transparent to business users as their applications are migrated into a more efficient, cost-saving, and scalable enterprise BI framework. Any BI tool used to conduct this evolution must ensure this gradual, transparent consolidation of departmental islands of BI. Enterprise BI environments provide organizations with high performance, optimal data and user scalability, and access to multiple cross-departmental applications. Although successfully developing an enterprise BI environment can take several years, it is a worthwhile investment because it promotes a single version of the truth and low total cost of ownership. 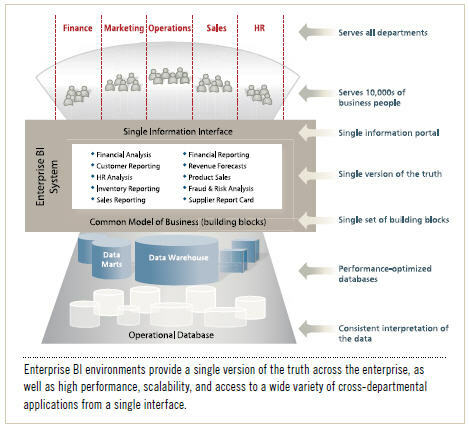 To achieve enterprise BI, organizations should develop an enterprise BI blueprint. This development strategy should be focused on fostering departmental islands of BI and finding a way to eventually merge them within an enterprise BI environment.